Lama Yeshe Drolma | Bodhi Path Europe e.V. Yeshe Drolma was born on the island of Wyk auf Foehr in North Frisia, Germany in 1945. 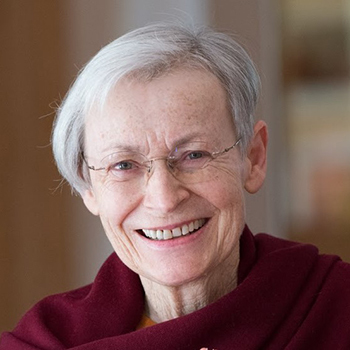 Shortly after meeting H. H. the 14th Shamarpa in Germany in 1986, she dedicated her life to Buddhist practice and study. From 1989 until 2000 Yeshe Drolma was in retreat, including the traditional 3-year retreat guided by the late Gendun Rinpoche. She was then sent to the United States to help develop the Bodhi Path Center in Martha’s Vineyard, Massachusetts. Since then she has expanded her activity to the center in New York City and to the Bodhi Path center in Renchen-Ulm, Germany.